The Red Baron's Flying Circus (Jasta 11) is seen in action over the western front in early April 1917. Rittmeister Frhr. 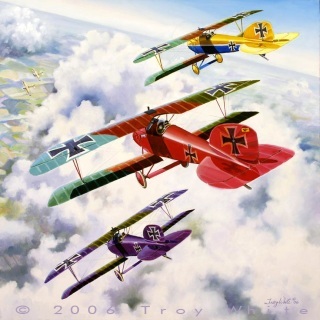 Von Richthofen, flying in the red Albatros D.III scout, Lt. Kurt Wolff in the purple machine and Lt. Edy Lübbert in the yellow and blue aircraft prepare to engage Sopwith 1-1/2 Strutters as they emerge from behind a cloud. 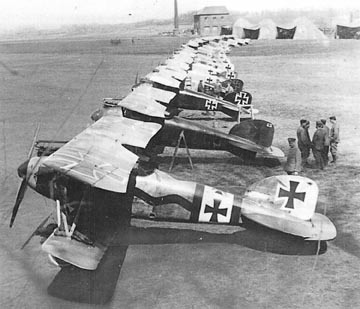 Jasta 11 had a lackluster record until Von Richthofen was given command of it in January 1917. 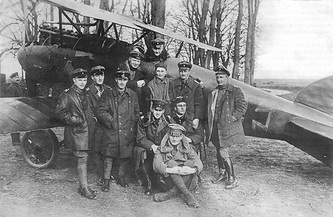 By the end of the month the unit began to reequip with the new Albatros D.III scout and Von Richthofen, who led by example saw his and the scores of his pilots rise. 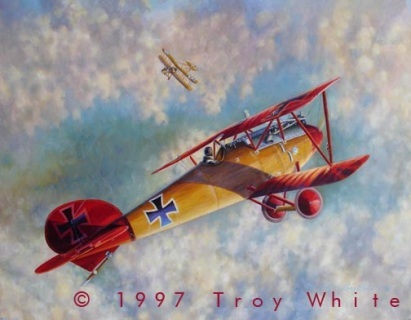 Aerial activity increased as the cold weather began moderating and before long Von Richthofen had his Albatros painted bright red so that his men could easily pick him out in the sky. His men followed suit by painting their machines in bright or distinctive colours. 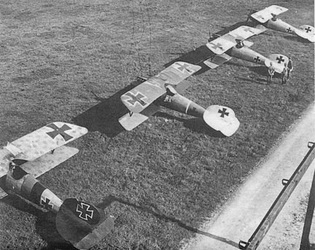 In March the Flying Circus acounted for 27 enemy aircraft (more than twice the number scored by any other German unit that month). The Red Baron was the high scorer with 10 enemy machines to his credit. 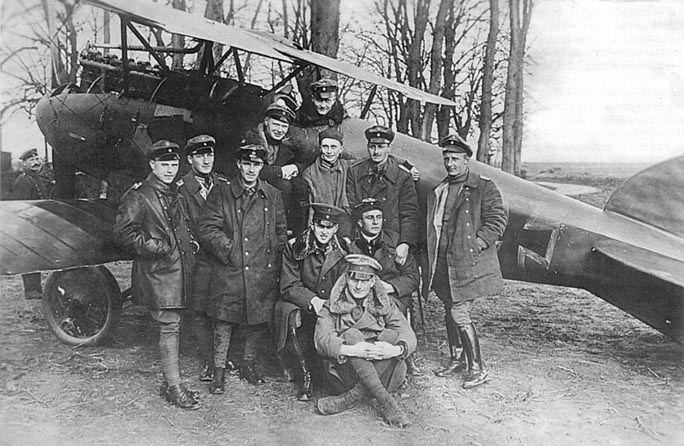 April 1917 would prove to be a very good month for Von Richthofen and the men of Jasta 11. Conversely it proved to be a dismal month for the British who dubbed it "Bloody April" During April the Flying Circus destroyed 89 enemy aircraft with the Red Baron downing 21 machines himself. Von Richthofen' s April harvest represented a little more than a quarter of his final total of 80 confirmed victories! Late in the morning of July 6, 1917, Rittmeister Frhr. 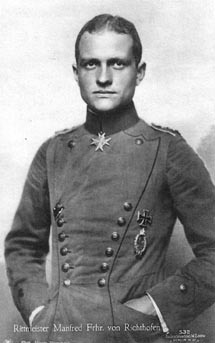 Von Richthofen (The Red Baron) led nine of his men on a patrol to intercept a number of British aircraft that were operating behind German lines. 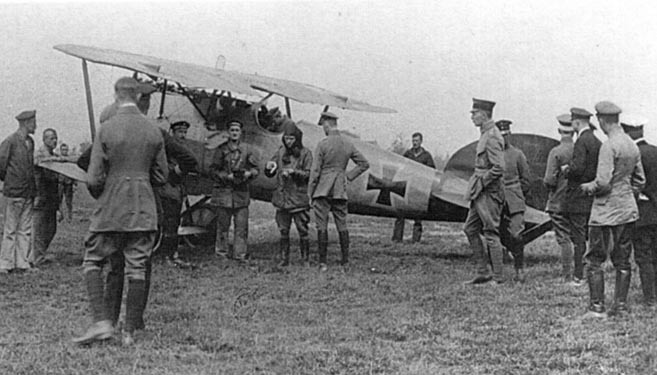 After identifying the aircraft as FE2ds, von Richthofen positioned his staffel to obtain a tactical advantage and commence an attack on the interloping Englishmen. Upon sighting the Germans, the FE2ds of No. 20 Squadron, Royal Flying Corps, turned into the potential threat. One aircraft, piloted by Capt. D.C. Cunnell with observer 2nd Lt. A.E. Woodbridge, began to fire while still at extreme range. Von Richthofen had been shot behind the left ear. 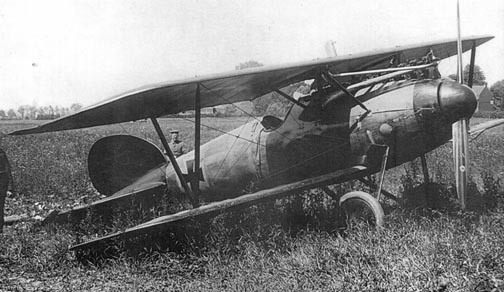 Momentarily blinded and paralyzed, he managed to regain control of his senses and aircraft to make an emergency landing on a Flanders field behind German lines. In 1968 several photos taken by one of the German soldiers at the scene of his emergency landing surfaced. 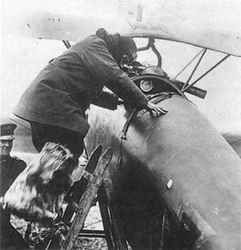 Those photos provided conclusive evidence as to what “The Red Baron’s” Albatros looked like the first time he was shot down. It is still not known for certain that a bullet from the gun of Lt. Woodbridge was responsible for downing von Richthofen. Some historians contend that he was actually hit by a bullet fired from the guns of one of his staffel because von Richthofen was hit from such an angle that the bullet must have come from behind, where most of his staffel was positioned. Whatever the case, von Richthofen' s ability to survive this incident is indicative of his skills as a pilot.